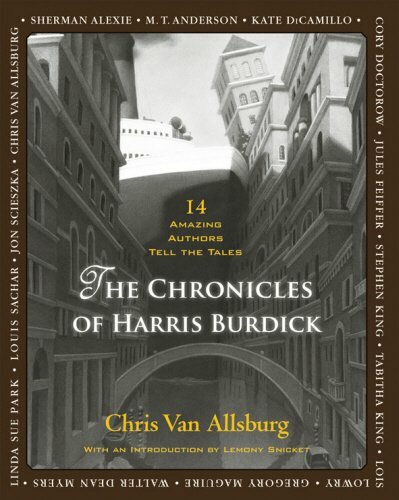 When these “chronicles” first appeared, nearly thirty years ago, they had two possible authors: either the illustrator under whose name they were published, or the mysterious Harris Burdick of the title, who, according to Van Allsburg, visited the illustrator one day and left these fourteen enigmatic illustrations, apparently each from a different story, never fulfilling his promise to return with the complete tales. Now they are published with fifteen superstar American authors (if you count Lemony Snicket’s introduction) providing their own stories for each illustration. In a sense, they are doing only what, since the initial publication, child readers have always been tempted to do (and some teachers have insisted that their classes do): using the illustrations with their intriguing captions as a springboard for their own imaginations. And there are some powerful imaginations at work. Given that Allsburg’s illustrations are likely to give rise to stories that are on the eerie and strange side, there are the differences of style and preoccupations in these stories that you might expect from a list as diverse as Stephen King, M.T.Andersen, Louis Sachar; Lois Lowry, Tabitha King, Jon Scieszka, Sherman Alexie, Gregory Maguire, Cory Doctorow, Jules Feiffer, Walter Dean Myers, Kate DiCamillo and Chris Van Allsburg himself. If you are as insular in your taste as I am, some of these names will be more familiar than others but this is a book that is remarkably uniform in standard: the authors that I didn’t know were just as good as the ones I did. Some tales are straightforward, Stephen King’s The House on Maple Street, first published as long ago as 1994, gives a relatively prosaic explanation of how a house might lift off like a rocket and why there would be one light left on in an upstairs room. But that’s not to say there aren’t some nail biting twists and turns. In contrast, Uninvited Guests, Jules Feiffer’s version of the craziness inside a veteran children’s author’s house and head, defies prediction; and the ending of Lois Lowry’s The Seven Chairs, in which a quiet nun’s extraordinary ability to levitate becomes the metaphor for one of the greatest social changes of the twentieth century, is simply breath taking. It’s a collection that does justice to the seductive power of the illustrations themselves, which are all reproduced here, and where, for all but a few of the stories, the distinction between adult and child reader becomes meaningless. These are just very good stories.